Maratime Research Institute Netherlands. Hydrodynamic consultancy for the maritime industry; advice, (flow) computations, model tests and full scale trials or monitoring for design of ship hull forms, propellers and offshore structures. Development and application of CFD codes to predict the flow around ship hulls and wave patterns. Specialist departments exist for powering, seakeeping and manoeuvring aspects of ships. The web site describes the ongoing research at MARIN, with links to descriptions of the CFD codes RAPID and PARNASSOS. You can also find publications, some downloadable. 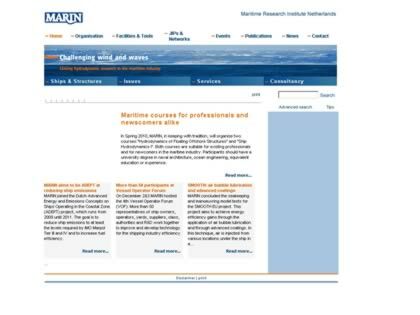 Web Site Snapshot: If available, above is a snapshot of the Marin web site at http://www.marin.nl/ as it appeared when this site was added to the directory or last verified. Please Note that Boat Design Net has no involvement with the above web site; all content and images depicted in the above thumbnail are the property and copyright of Marin unless otherwise noted on that site. Description: Maratime Research Institute Netherlands. Hydrodynamic consultancy for the maritime industry; advice, (flow) computations, model tests and full scale trials or monitoring for design of ship hull forms, propellers and offshore structures. Development and application of CFD codes to predict the flow around ship hulls and wave patterns. Specialist departments exist for powering, seakeeping and manoeuvring aspects of ships. The web site describes the ongoing research at MARIN, with links to descriptions of the CFD codes RAPID and PARNASSOS. You can also find publications, some downloadable.